Glad to hear you are also a Minolta SRT fan. Amazing how much life these cameras have left in them. And quite a steal, at current price levels. You should pick a few more focal lengths to have available for use. I've gotten them recently in the $5-$30 range so it's really hard to go wrong, especially if you can inspect them beforehand, or return them, if you don't like 'em. I am looking forward to finding a nice XK this year. Posts like this just confirm that it's the right move to make. I'm not associated with this listing in any way, just thought you might want to take a look. ...this is the setup, a D200 w/80-400 Nikkor on a Gitzo 1340 w/Kirk BH-3 ballhead. Oh, I use the remote shutter release as well. My Dad was a Newspaper Photog back in the 60's & 70's. He used (2) SRT-101's and the famous SRM. I remember driving with him to Minolta's USA HQ in Ramsey, NJ to visit Mr. John Johnny to get cameras serviced while you waited! 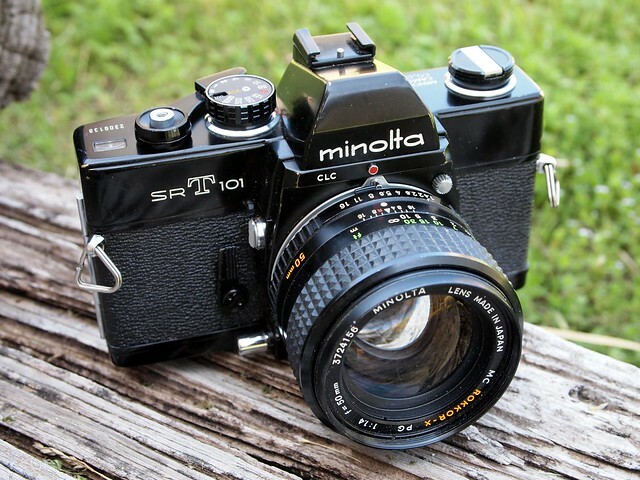 Pro service was one of the reasons why Newspaper Photogs bought Minoltas! That was a nice camera system! The SRM had an electronic release built into the motor. One of his favorite lenses was an old preset Sun Optical 70-210 F4.8 with pistol grip. You squeezed the pistol grip to stop the lens down just prior to the shutter firing and a plunger made out of a common nail came out the back of the pistol grip just far enough to push an electronic release button (mounted on a small piece of aluminum) that was plugged into the mini-jack on the motor. Quite ingenious yet simple design that always worked. Enabled you to follow-focus or zoom as you took photos at 3 FPS! High School football never looked so good! Motorized "strips" of a QB handing-off to a Running Back were the norm instead of the exception! He used to tape the cropped vertical 1/2 frame images together with scotch tape and the Sports Editor would run them 3 or 4 columns wide by 5 or 6 inches deep, sometimes more! That rig of his was smaller & lighter than a Nikon F with cordless F-36 motor or a Canon F-1 with either of the two motors available for it. Metering was never a problem, his Luna-Pro did just fine! He used to rate Tri-X at 800 ASA and develope it in Ethol UFG for 7.5 minutes @ 70 degrees. By todays' standards the zoom wasn't the sharpest in the world, but I wish I still had it as it's use created thousands of published photos in the Home News of New Brunswick, NJ. Sadly it perished in a house fire after his passing. I clicked on this thread to garner a piece of nostalgia for which I'm sincerely grateful. Thanks for letting me "take the ride"! Oh, and that link to the ebay sale of the "Newspaper beat XK" is also quite interesting. I may have been in it's company while it was actually being used by the Courier News Staff Photogs! As a "Stringer" I freelanced for the Home News decades ago, back when daily newspapers used to be owned by private family companies in competition with each other for readers & advertisers. I probably shot right next to whom ever was using the XK in that very same ad! Again, thanks for the memories! 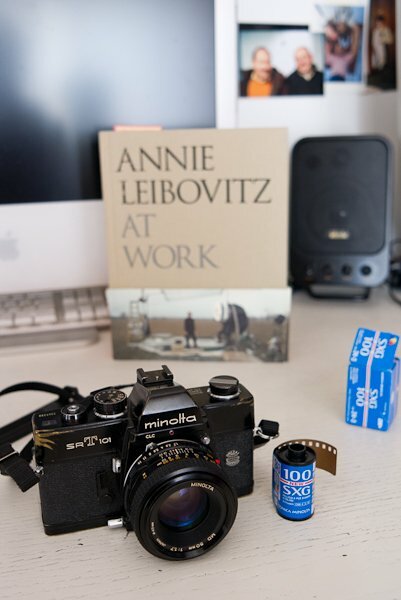 Hope you all continue to enjoy your Minoltas! Dad always said, "The camera merely holds the film flat and lets the shutter expose it for a fraction of a second. It's the LENS that takes the Picture"! Dad is still right! I have the Sun lens you mentioned, for Minolta, if you're interested. Although I dont have the pistol grip. The Sun Optical Zoom lens is 85-210 F4.8, not 70-210. Sorry for the confusion. Found one today on ebay for $65.00 with Nikon T-mount. The pistol grip isn't an accessory, it's part of the preset diaphragm system. Part of what makes this piece of glass very unique. I'm sure you'll love it. Its a very nice camera to use. The only problem is, sometimes I baby it too much. I don't use it much in the winter time, but then I have all those SRT 101's that I was picking up for a while whenever one went for a ridiculously low price on ebay. In the winter I have an SRT loaded with HP5 @ 400, one with HP5 @ 1600, one with Delta 3200. Sometimes one with Pan F if I want to go tripod shooting. I must admit though, lately I have started to get a soft spot for Nikkormat FTN's. Nice story about the SRM. Honestly I have not met many people who have actually owned and used one. Here is another SRM story: I met Fred DeVan on another photo userforum, and he was very excited and enthusiastic that I was interested in the SRM, and had just purchased one. Back when I was shooting High School Football games and other photojournalism, I had -never- seen the SRM, only read about it in detail, from Joseph Cooper's giant Minolta SRT Handbook. There is an entire chapter dedicated to the SRM, and it goes into great detail about the camera and it's use. Anyway, Fred DeVan was (is) a photographer for LIFE Magazine, and a Photo Editor and Photographer for ROAD&TRACK Magazines for many years, and was a devoted user of the SRM. He told me a story, about how he photographed Sly Stone's wedding, which was held in Madison Square Garden, for LIFE Magazine. With the help of multiple assistants, he mounted four motorized SRM cameras into the ceiling rigging of the Garden, each camera equipped with a 250 exposure back, and a Minolta Intervalometer. So he was getting a remote shot from each camera, every few seconds. The assistant's job was to keep the cameras freshly loaded, and running. The pictures were published in LIFE. Fred was very helpful is telling me what parts to look out for, but frankly they have not real easy to find in my experience. SRM's probably end up in the hands of camera collectors, which is sort of a shame, if they're not using them IMO. Anyway, I hope Fred is still around and doing well. Would love to talk to him again. I'm sure you'll love it. Its a very nice camera to use. The only problem is, sometimes I baby it too much. I don't use it much in the winter time, but then I have all those SRT 101's that I was picking up for a while whenever one went for a ridiculously low price on ebay. In the winter I have an SRT loaded with HP5 @ 400, one with HP5 @ 1600, one with Delta 3200. Sometimes one with Pan F if I want to go tripod shooting. That's exactly how I use my SRT's. I keep two loaded with slow film (Panatomic-X, Ilford Pan F, Efke 25), two with medium speed (Eastman 5222 Double-X Movie Film, Tri-X, or Presto Fuji400) and two with highspeed film (Presto Fuji 1600 or Ilfrd Delta3200). It's a real pleasure to have so many multiple bodies. I keep them always loaded, just grab whatever is appropriate, for the prevailing weather conditions, and the type of work that I am intending to do. These have not let me down, and I certainly don't "baby" them. Have you ever had any problems with the "Sensiswitch" on the front of the XK? Another friend told he they thought the XK was "clumsy" compared to the XE-7, the Sensiswitch was problematic. Of course, a CLA would probably solve that problem. Well, I got curious and dug out the lens from behind a small sea of lenses. I guess I was confused as well. It is indeed the 85-210/4.8 you mention, but does not have the pistol grip. Rather a tripod collar that made me think of the grip version that I saw searching for info. I now remember picking it up on a whim from the local Goodwill because I liked the feel of it and with the simple, smooth, 1/4 turn zoom lever, and well damped focus, it would make a fun video lens for my Canon 7D. And mine is a T mount with a Minolta bayonet. Maybe I should get a Canon T mount adapter and try it out. It couldn't hurt to try it out! Just remember it's NOT Zeiss glass, so the use of the hard metal lens hood (that came with the optic) is very helpful in combating flare and chromatic aberrations. One other thing you'll notice is that once you focus the lens at 210mm, it WILL stay sharp as you zoom it all of the way down to 85mm! Dad was very proud of that and credited same as helping him get some of those great High school sports moments on film! Thanks for writing & good luck with the lens! Terrific SRM story! Sounds like Fred knew John Johnny too! Might have even borrowed some stuff from him (the Intervolometer) to do that shoot! The mini-jack on the SRM bodies were quite state of the art back then. As I recall not too many motorized cameras had the ability to be driven unmanned (without modification). That was also one of their selling points, and probably why Fred chose them for that assignment! Again a delightful story, and thanks for sharing! Back when Dad had his SRM (in the 70's) there were a select few fellow Newspaper Photogs that even owned motordrives. In the late 70's that began to change. The Paper my Dad worked for then chose to discontinue the "Camera Allowance" monthly reimbursement paid to the Staff Photographers and opted to purchase each Staffer a mini Nikon system consisting of a F-2, a Nikkormat ELW with 2FPS winder, as well as a 35 F1.4, 105 F2.5, 180 F2.8 ED and other various Nikkor lenses. If memory serves correctly, the Paper bought ONE Motor Drive for all of the F-2 bodies among the guys to share. So that SRM still received some use! Then Dad retired and it was my turn to use it. Oh the memories! And those Rokkor lenses were quite decent as I recall. Lots of newspaper Photogs used Minoltas and proudly so! They were never regarded as a "******* Step-Child" as some may think. Instead they were looked upon as a friend, a workhorse that could always be counted upon to get "THE SHOT"! I have read Internet reviews that criticise the sensiswitch. I have never had a problem with mine and I find it a useful feature. It well placed to activate easily while shooting. I like it because I can leave the power switch turned off if I want to walk around with the lense cap off. That way the meter isn't being constantly activated and there is less battery drain. If I want to take a shot, I just press the switch on the front of the body while shooting. This will only work in manual metering mode however. In automatic mode you must have the power switch turned on. I have an XE-7 as well and I prefer useing the XK, primarily due to the light meter display in the XE7 which I don't like as well. I do prefer the smaller size of the XE7, but you have to sacrifice something to get the great options of the XK. The shutter on my XK also feels smoother than the XE7. I have no problem at all useing the XK at 1/15 sec. I did buy a new AE finder for my XK because I found that the aperture window in the viewfinder wasn't well illuminated in my old one. That may be something to watch out for. I bought a 101 with a 50 or was it 58? 1.4 on a whim around 5 years ago. In the 70's when I was in secondary school, I used to get Amateur Photographer every week and look over the ads for all those old school cameras. I badly wanted to buy a minolta but couldn't afford it. I was only 12 at the time. After messing with it for a couple of weeks I sold it. Huge disappointment, build quality was superb but the viewfinder was dismal. Dim and hard to focus. It's not just Minolta's though. I had the same feeling with Spotmatics. I of course had younger eyes back then but having been spoiled by using all the pro Nikon bodies and latterly the Leicaflex, these old minolta, pentax, canon, yashica etc cameras remain memories to be looked back on with rose tint specs. I have read Internet reviews that criticise the sensiswitch. I have never had a problem with mine and I find it a useful feature. It well placed to activate easily while shooting. I like it because I can leave the power switch turned off if I want to walk around with the lense cap off. That way the meter isn't being constantly activated and there is less battery drain. If I want to take a shot, I just press the switch on the front of the body while shooting. This will only work in manual metering mode however. In automatic mode you must have the power switch turned on. The shutter on my XK also feels smoother than the XE7. I have no problem at all useing the XK at 1/15 sec. I did buy a new AE finder for my XK because I found that the aperture window in the viewfinder wasn't well illuminated in my old one. That may be something to watch out for. Thanks for the additional info on the XK. Finally, I can join you guys after 10 days registering this forum in hell. Ok, I just want to say hi and hearing your experience with minolta. Well, I lost a like new XM in ebay deutschland bidding, what a crazy crush ever. 160 to 361 euro in 1 minute. Anyway, I am just return to my XD7 and Srt102, and seem like it's enough for me. Here is one more Minolta SRM story. Fred used to travel the country for CAR&DRIVER magazine. He told me he would stand in the center of the racetrack, and two 200mph racecars would come speeding by, within feet of him on either side. He would shoot continuously with the SRM and the legendary 21mm F2.8 MC Rokkor. He traveled in a fully-accessorized custom motorhome, and even had enlisted the services of the Chef who worked for Pink Floyd. He said he went through cases of 35mm Kodachrome, shipping it right out after each event. He never saw the finished chromes until they appeared in the magazine each month. Look what I just bought, for when my Wife & I go out, and photograph the Herons and other birds, at the local parks. The Minolta 400mm F5.6 Apo Rokkor-X, and the matching Minolta Apo 2X Teleconverter. The price is good, and it's from a known dealer, that I have bought from before. This will give me an 800mm F11 with high optical quality (no purple fringing). I am stoked to get it. 800mm should be plenty of telephoto pull, for getting tight closeups. This is going to be fun. Nice! And with a tripod collar too! Wow! Good shooting! Just got vivitar series 1 70-210 komine made 55 usd from ebay. When I see it in front of my eyes, I cant believe I have searched for it 3 months, and now it comes to me in very good condition with that price. Should I cry now, or wait until I get my XD7/XD5 to complete my photography studying gear? Sunday was warm and Sunny, so my Wife and I went birding. Great opportunity to wring-out my new 800mm F11 Apo-Rokkor. Took a Manfrotto Monopod, and a medium Manfrotto Ballhead. It worked very well, but I think I will prefer a heavy tripod for this arrangement. Afterwards we went for BBQ chicken wings and draft Guiness. It was a very productive trip. Got some fantastic closeups of Blue Herons building their nests, on Fuji Presto 400 B&W. Used my ringneck-lizard covered SRT101. No issues at all with using this equipment. The new Apo lens is a delight. I bought an SRT-101 with a 50 1.7 PF at the swap meet a few weeks ago for peanuts. I ran a roll of film through it and got some wonderful shots back. The body and meter were really a pleasure to use. I ended up passing it along to an APUGr for a few $ more then I paid just so I didn't start buying up a bunch of Minolta lenses to go along with it. Though frankly, I don't think I'll ever be able to pass up a reasonable deal on another—provided it's in good working order at least. That Vivi Series 1 you got Kyonthinh, it will be a great lens. I'm always surprised at how little they sell for. I've found 3!! at local swap meets and have yet to pay more then $30 for one. I even got one for $10... gave it to a friend as a gift. Sometimes I post my photos on flickr. Sometimes I update my tumblr. My Minolta glass is now pulling double duty. I now have the adapter to use them on my E-PL1 and they are still being used on my Minolta bodies..
Yeah, I know it will be a keeper. I dont know what's wrong with this world, sometimes you see one for crazy low price, sometimes it's very high. But you must have luck all the times. And I see that many people who's forgotten what Minolta was at that time, with the price they sell Minolta lens. Picked up this black paint 101 off eBay. Got it cheap because of some issues but had them fix within a couple of hours.. I part exed an OM1 for an SRT 201 back when - could not get on with the tiny controls . Bought one of the last clearance 101b which has had little use , and added a boxed 1st type 101 in chrome [ cross head screws ] plus black 101s with both cross head and later phillips screws . Love 'em to bits ! Contax/Kiev hybrids - Contax II silver /tan , Contax III + Kiev IV meter etc , Contax II , Kiev shutter from parts camera . Puns,Cameras and snapshots keeping ASD and dees'ruptive Girl/Boy/Me?' dee'structive dee'sorientation contained. I finally got one.........a MC Rokkor-X 50mm f/3.5 Macro lens.. I've had the 1:1 converter for years but no lens.. I just got the MD 50/3.5 Macro with with 1:1 ring. Can't wait to use it. I enjoyed looking at your blog. You should get your SRT overhauled, likely after forty years it will need a good cleaning inside. BTW I just received the Annie Leibovitz book you show in your digipix. Annie was also my hero growing up, so it will be fun to read about the early exploits. I have always noticed that a few of my bodies are a bit "loose" when attached to certain lenses. I'm now sending the worst of those to "Mountain Dawg" out in Durango, Colorado. For $80 he will -completely- strip the body down, and clean everything thoroughly and completely adjust everything. If he does a good job (and I have every reason to believe I'll be delighted, with basically a like-new camera) I may have a few more bodies for him to do over time. And, he says there is a "flat spring" (type of assembly that I can see inside the lens mount) that can lose it's spring tension over time and heavy use. Easy to replace with a good one (he has plenty of good parts to pull), while doing the complete disassembly. He says you won't believe how clean and bright the viewfinder can be. I have the original Minolta repair manual, but I'd rather have an expert do all this work for me. Thank you Nokton48. After Easter time I'll check how my old but not too old X-700 works. In case of any problem I'll bring both camera for a cleaning and checking in a appropriate laboratory (I'm very bad in manual operations!). Well, I've just got my two srt-102, but now I want one more. Is XD11/7 well worth the money when compare to srt 102? Yes! My XD7 is my go to film slr: solid and smooth with a great viewfinder. I bought an srt because it had the 50mm 1.4 lens attached - although I'm sure its a great camera, it does not have the same ergonomics as the XD and has never got a look in. Thank you very much. I will wait in ebay for one. And lol, I've just studied one lesson and it mentions Bratislava. Not an SRT of course. Still in use,love that 1.4 Rokker. Well, glad you got them, I didnt use my macro lens since I've bought it. How can the XD7 is so expensive now, more than 50 euro for one? Lol.